Exactly a week ago, along with other family members, I visited our grand-aunty and her family, gathered on every second evening of the Lunar New Year in our usual tradition. It was a good time of meeting family members again, catching up on the latest happenings and noticing how much the youngsters have grown in the last 12 months! Small groups formed in natural clusters to chit-chat and I found myself seated next to grand-aunty and her daughter, Aunty Agnes. After a delightful dinner, it was time to chill and nibble on cookies and crisps as we exchanged newsy updates with each other. One day while grand-aunty and her domestic helper were in the front garden, they saw some neighbours passing by. It was a Filipina domestic helper wheeling a Chinese lady (seated on a wheelchair) on an evening ‘walk’ around their residential area. She introduced the lady on the wheelchair as Mrs Paul and being neighbourly, the two helpers had a conversation and soon discovered that they had something in common – they were assigned from the same agency! In the next few days, Mrs Paul was ‘walked’ around to visit our grand-aunty as the helpers got to know each other better. Curious about Mrs Paul and her helper, Aunty Agnes decided to pay them a visit where they lived, just a few roads away in the same residential area. When Aunty Agnes stepped into their house, she instantly recognized Mrs Paul, the Chinese lady seated on the wheelchair. When she was introduced to her husband, Mr Paul, who was then reading, aunty said she was struck by how much he reminded her of my dad! In the course of their conversation, Mr Paul commented that he was reading about a man (my dad?) in a book written by his daughter. Aunty took a closer look at the book and she was pleasantly surprised that Mr Paul was indeed reading my book, My Johor Stories: True Tales, Real People, Rich Heritage! She introduced herself as the writer’s aunty and so thrilled was she at the circumstances which led to this, that she wished to invite the writer over to meet him! It was fascinating to hear about this experience so I arranged with aunty to bring my mum along with her mum and helper to visit Mr & Mrs Paul in their home the following Saturday. I requested that we informed Mr & Mrs Paul in advance to seek the best time to visit. Then I learnt that their daughter, Cynthia, was here and I looked forward to meeting her too. It’s a morning wet with steady showers as I park in front of the home of D. Robertson Paul. With the help of umbrellas, we drip into the front porch and then aunty introduces me to Mr & Mrs Paul. Seated on a wooden rocking chair, Mr Paul, aged 90, is all set to share a bit about himself. He tells us that he’s from Seremban and in Johor Baru, they used to live at Jalan Quek Keng Kang before moving into this house in 1970. In 1962, he married his Chinese wife, whom he first met during a church camp. He pointed to her with affection and said he decided to live in JB because of her. This was because she had a teaching career in JB while he opted to commute to Singapore where he served as a civil servant and taught in various schools until his retirement. With this knowledge in mind, I smile when Mr Paul shares about how Trinity College London sought him out after his retirement (he was a former teacher in Singapore) to invite him to embark on the next chapter of his life with them. Even though he had no music background, Mr Paul accepted the challenge with Trinity College London, responsible for the region covering Malaysia and Singapore, and learnt all about music exams and more during his tenure with them from 1986 to 1998. After a long and eventful career in education, Mr Paul now spends his time reading and writing his memoirs. His daughter, Delia, a former journalist with The Star newspapers, recently helped to upload his writings into a personal blog. I sense a great deal of pride in his three children as he mentions them one-by-one. Mr Paul says he met with Mrs Comber. I guess he would have met her because she lived and worked here for 12 years. He was referring to her as mentioned in my book under Memories, Our Han SuYin Connection. Dr Elizabeth C.K. Comber, born Elizabeth Chow Kuanghu (Zhou Guang-Hu), later married Leon F. Comber, a Malayan Special Branch police officer during the 1948-1960 Emergency and they relocated to live in Malaya. Mrs Comber also known as Dr Comber or by her maiden name, Dr Chow, was also a novelist who wrote in French, Mandarin and mostly in English under her pen-name, Han SuYin. Mr Paul then quizzed me, asking if I know the maiden surname of Dawn Parry, the personality I featured as, Lady Extraordinaire, in the Portraits section of my book. I soon discover that this is his pet subject as he returns to it time and again during the course of our conversation. He must have reminisced about it because he prepared a Black & White postcard-size old photograph, ready to show me. On the reverse side of the photo, in his cursive handwriting was written, Sept 1948, School Prefects. Having written about her, I’m familiar with the former Dawn Ngui Chon Oi, and am aware that she was once the Head Girl in Anglo Chinese School (ACS), Seremban. Her elegant features are easily recognizable from the photo, seated second from the left. Mr Paul makes me scrutinize the photo to see if I can identify her because while she was Head Girl, he was not only her schoolmate but also the Head Boy in 1948! With vivid recollections of their school days, Mr Paul shared interesting anecdotes about his contemporaries as well as Dawn’s father, who was then headmaster of ACS Primary, and confided other juicy details which he reminded me, not to write about! Like Dawn, their education was interrupted by World War Two. To appreciate his struggle with education, Mr Paul encouraged me to read his memoirs stored in his blog. Mr Paul goes on to tell me that he was also then, the Editor of the ACS school magazine. He pauses to call the helper to please show me a copy of the school magazine and I turn to watch as she carefully lifts it out of an old wooden photo frame. As I hold its delicate yellowed pages in my hands, Mr Paul reminds me that he only has this 1952 issue of the magazine dubbed, The Silent Signpost. This is very special indeed. While its cover was ‘colour printed,’ the magazine contents and photographs were printed in Black & White. As he talks about himself who was once Editor of his school magazine, Mr Paul reveals that his son is Editor of The Edge Singapore, a business and investment weekly. I cannot help but smile at this uncanny connection because last year, The Edge Malaysia had a special publication on Johor entitled, Uniquely Johor, and I was one of the featured Johor personalities! Mr Paul then talks about the former Singapore president, S. R. Nathan, whose wife, the former Ms Nandey, was a Johor girl. He explains that while he was born in Seremban, his career was mainly in Singapore so he was familiar with Singapore politics and other than his church friends, there are not many friends in JB. His daughter, Cynthia, joins us and she says sotto voce, that her father is a fountain of information, as he continues regaling us with his recollections and anecdotes. Then Cynthia tells me how she enjoys reading my stories like Going Back to Masai-chusetts and especially about the midwife! Aunty Agnes then reiterates to Cynthia that her dad just reminds her of mine. So we turn the pages of my book to find a portrait photo of my dad in, We are OCBC, and place Mr Paul’s group photo next to it. Cynthia and I agree that they do resemble each other mainly because of the way they styled their hair as it was fashionable in the late 1940s! And before we leave, I must autograph my book for Mr Paul. Thanks Aunty Agnes, for the pleasure of meeting with the Paul’s. Educity’s inaugural Duathlon held at Iskandar Puteri recently, attracted 450 participants from running groups and individual enthusiasts who took part in the Sprint and Endurance competitions for Men and Women in the Open, Senior and Veteran categories. While Educity provided the participants with their event T-shirt, some participants preferred to don their own running club’s costumes, clearly emblazoned with their colourful logos and club names. At the crack of dawn, participants gathered at Educity stadium grounds and Iskandar Puteri mayor, Haji Adib Azhari Daud, flagged off the Endurance Race at 7am. In the grueling Endurance race, participants completed a 10-kilometer run followed by a 60 km bicycle ride and ended with another 10 km run. Fifteen minutes after the first flag-off, EduCity Managing Director, Joanne Oei, flagged off the Sprint Race where participants completed a five-kilometer run followed by a 30 km bicycle ride and ended with another five-km run. I watched from the Start/Finish line and spotted familiar running/cycling club names like Graziella and Treximo as the participants returned triumphantly and were rewarded with their Finisher medals. The top five winners in the two races received trophies and prize money while the inspiring finishes by Sprint Champions, Mohd Zuhar Ismail (01:30:06) and Tan Pei Lin (01:50:21), also earned them the top honour as Sprint Overall Champions. Pei Lin, Third Place winner in the Women Veteran category, was recognised for her commitment to consistent training and competitive spirit. A mother of a 16-year old son, Pei Lin, 50, is no stranger to such grueling competitions as she is the two-time defending champion at the Powerman Asia Duathlon, Putrajaya race. “This is like a pre-event warm-up race for me,” said Pei Lin after receiving her Sprint Overall Champion trophy. An Admissions Executive with Taylor’s International School and Selangor state runner, Pei Lin trains six days per week with her son every morning before going to her work and he, to his classes. A father of three children aged 10 and below, Mohd Zuhar Ismail, 33, trains regularly with his team dubbed, Sukan Lasak ATM, short-form for Angkatan Tentera Malaysia (Malaysian Armed Forces). Mohd Azuan Asmuni and Alisson Yee won the Men and Women Endurance Overall Championship titles with record times of 02:57:23 and 03:23:51, respectively. Winner of the Men’s Open (age 18 – 29) category, Mohd Halif Husin, said he consistently competed for the top-spot with Mohd Azuan Asmuni, his colleague at Kem Sungai Udang in Melaka. He also revealed that twelve of their team mates participated in the Duathlon and regularly travelled as a group and challenged each other in their endurance power. “The Duathlon tested the athletes’ determination to reach the finishing line and Educity is proud to gather such active sportsmen and sportswomen today,” said Oei. “Taking part in a Duathlon is not a small feat and we hope this visionary display of willpower and hope will inspire our young children to detach themselves from their gadgets,” she added. The inaugural Educity Duathlon brought the athletes on their run and ride race through several scenic routes in Iskandar Puteri. Once again, the city that has been hosting extreme sports and marathons in the past few years, had attracted athletes not only from throughout Malaysia to battle it out for the top titles but also from Singapore, Thailand, New Zealand, England and the Philippines. Iskandar Puteri has much to offer young athletes in terms of space and this includes dedicated cycling lanes for budding cyclists in Medini. Oei presented the cash prizes and medals to deserving winners and announced that more sporting activities are planned for 2018 including the much anticipated Educity Sundown Marathon, Kickboxing, Swimming and Rugby fests. All around the world where there is a large Chinese community, there will be an exodus of people travelling back to their hometowns in the tradition of balik kampung during the pre-Lunar New Year days. As we consider the concept of balik kampung where families join their elders to celebrate Hari Raya Aidilfitri, it’s easy to draw a parallel with how the Chinese have a tradition of sitting down to a family reunion dinner on the eve of the Lunar New Year. From a very young age, I used to look forward to the Lunar New Year because it was that time of year when cousins meet again to play and on the first day of the lunar calendar, we would dress up in new outfits and receive red packets filled with fortune money! As a child, I did not question why our family went to Ah Kong or mum’s father’s house for the reunion dinner instead of going to dad’s father’s house. It was much later, when I learnt about the tradition of sons and their wives and families going to their father’s house for the annual reunion dinner that I finally figured it out. According to Chinese tradition, a married woman would join her husband and in-laws for the reunion dinner and will not visit her own parents until after the dawn of the lunar new year. It was an eye-opening discovery for me when I realised that we did not have any reunion dinner with dad’s parents simply because he did not have any living family members. So for our family, it was easy to balik kampung for the Lunar New Year because we lived just a driving distance away from Ah Kong’s house at No. 154 Jalan Ngee Heng. But for those who lived away from hometowns, they must plan ahead for the journey, taking into consideration the packing of fresh and cooked food, new clothes and travel plans like making transport reservations or getting the car ready for self-driving. This entire exercise is similar to how families would return to their hometowns to celebrate Hari Raya Aidilfitri with their elders. The only difference may probably be their destinations because many married Malay couples have an agreement to balik kampung for Hari Raya to either spouse’s parents’ homes on alternate years! While we share the same Gregorian calendar – a solar calendar system that evolved from the lunar calendar – with the world, the Chinese have a traditional lunar calendar based on the monthly cycles of the moon’s phases. According to Chinese astrology, the lunar calendar follows a 12-year cycle where each year is represented by an animal so those born in those years are reputed to inherit the said animal’s attributes. During my secondary school days, I discovered the astrological signs when I listened to my classmates discussing their horoscopes and which zodiac sign (based on birth month!) they were born under. It was much later that I learnt that the Western zodiac was unlike that of the Chinese which runs in a 12-year cycle, beginning with the Year of the Rat, followed by Ox, Tiger, Rabbit, Dragon, Snake, Horse, Goat, Monkey, Rooster, Dog and ending with the Year of the Pig. In recent years, as Chinese local and cable television channels broadcast more shows and advertisements to welcome the coming Lunar New Year, the came up with creative mascots or animal icons that represented the coming animal year. I remember a news report from Hong Kong in the previous Year of the Dog (12 years ago!) which reminded people to be mindful about getting a puppy for a pet for the Lunar New Year because in reality, it means a life-long commitment to care for the pet. This friendly reminder from the animal-loving community, warned of abandoned pet dogs later in the year when puppies out-grew their cuteness and owners could not keep up the responsibility of caring for them! While the Chinese practice a host of do’s and don’ts to ensure the start of a better year, one of their traditional rituals is to set off firecrackers at the stroke of midnight on the eve of the Lunar New Year which originally, aimed to scare away evil spirits. In Chinese folklore, a monster named Nian (Year) would prowl the village to destroy homes and eat villagers on each New Year’s Eve, so the loud explosions were made to scare aware this horrible monster! As most traditional Chinese tend to keep this practice, it was like a war-zone in Chinese neighbourhoods where ear-shattering firecrackers assaulted our ears and scared the daylights out of our pets. Meanwhile, the Chinese would not sweep the red paper from the firecrackers away as the act of sweeping on this auspicious day was like sweeping wealth away! 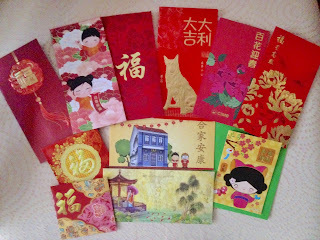 One of my favourite Lunar New Year traditions must be the tradition of presenting red packets or hong pau (Cantonese) filled with fortune money (lai see). I was taught that it’s not about the contents of the packet but the symbolism of the Red packet. In Chinese culture, Red is an auspicious colour as it symbolises good fortune, joy and happiness. It is the colour worn by traditional brides, as in the kwa or qipao, as an auspicious colour to ward off evil. In traditional Chinese colour symbolism, Red generally represents vitality, celebration and fertility. So Lunar New Year decorations are mostly in Red and Gold as these colours are associated with wealth and prosperity. Some families decorate their homes with Chinese couplets written in Chinese calligraphy to adorn their doorposts and main door. On the front door, the Chinese character for “Fook” which means ‘good fortune’ is often deliberately displayed upside-down! Good fortune is always welcome so the tradition of tossing the prosperity Yee Sang salad has also been adopted here for Lunar New Year events. By now, people in our multi-cultural community are already familiar with the art of tossing and eating Yee Sang. Even the non-Chinese serving staff are familiar with the sequence of topping the salad with the various auspicious ingredients. But my request to restaurants which serve Yee Sang is to train your serving staff to utter the appropriate phrases as they add the ingredients to the platter in order to present a complete Lo Hei (toss for prosperity) experience! Simple translations of the auspicious Chinese phrases can be paraphrased and learnt in English and even Malay, to make the presentation more meaningful – and educational – for diners from every culture. Believe me, your restaurant will certainly have an added edge over the others! 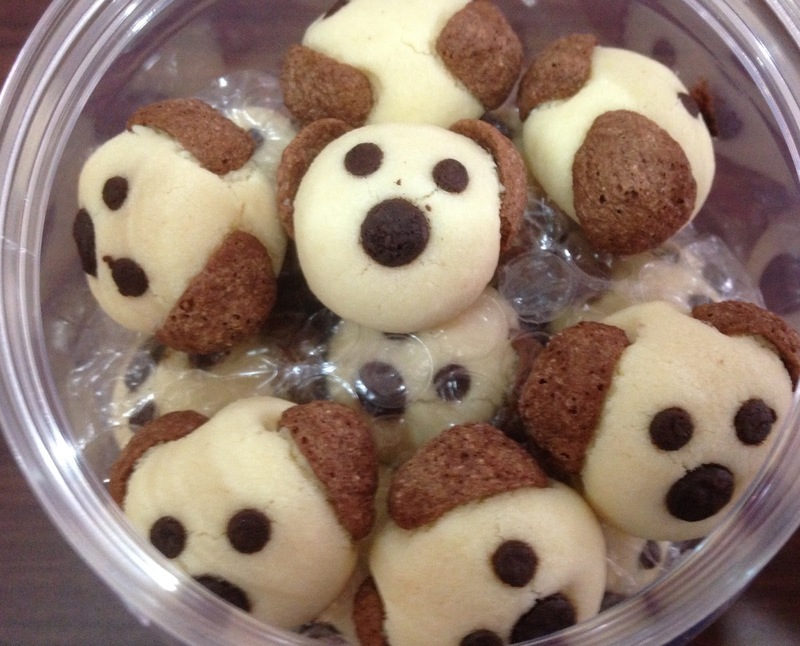 Cookies created with cute puppy faces! To celebrate this Year of the Dog, chefs have exceeded expectations by creatively arranging the vegetables on the salad platter to resemble the image of a cute dog or puppy! Similarly, bakers also created batches of biscuits designed in cute puppy faces. But there’s no need to stretch the imagination or be overly sensitive at the appalling idea of eating a dog or pup because these food presentations are but an arty display of the baker’s or chef’s creativity. Having lived together for decades, the practice of letting off loud explosions at the stroke of midnight on Lunar New Year’s eve had inadvertently been adopted by every race group in our multi-cultural community. I don’t think we needed to ward off evil but letting off fireworks at midnight in the New Year tradition seems to be normal practice for every festival here. Even while the meriam buluh (bamboo cannon) remains a traditional favourite in Malay kampungs, a range of fireworks and explosions help to announce the dawn of the various annual festivals in our community. In the same way, the Chinese tradition of giving Red packets is now practiced by the other communities by using Green packets for Raya and Purple packets for Deepavali. While giving duit Raya has always been a tradition, a monetary gift presented in a decorated packet seems to be an accepted norm now. The range of cookies we enjoy during the Lunar New Year are not unlike the cookies we eat at Hari Raya, simply because some of the best pineapple tarts served during the Lunar New Year, are made by Malay vendors/bakers! It’s interesting to see that in many homes besides cookies, there are traditional crisps like spicy kerepek ubi, kueh Ros, rempeyek and even muruku served along with Lunar New Year staples like pineapple tarts and Mandarin oranges! If we looked a little closer, we will soon discover that after more than 60 years as a nation, there are indeed so much more that we already share that we even forgot that a food item or a tradition, had its origins in another culture. So in spite of our cultural diversity, let’s seek unity for our common good. Early last December, Ina Zhang Xing Hong, a researcher with Nanyang Technological University (NTU), Centre for Chinese Language and Culture (CCLC) Singapore, sent an email to introduce herself and said that she enjoys reading my blog, My Johor Stories, especially the stories on Han SuYin. She explained that she is involved in the study of doctor and author, Han SuYin, and had completed her academic thesis on Han SuYin when she was in Malaya from 1952 to 1964, focusing on her as a physician, writer and public intellectual. Written in Chinese language, this thesis for Zhang’s Masters programme in Chinese Studies in 2013 was co-published with NTU CCLCC in a book in 2016. Zhang said she would be visiting Johor Baru with her husband in the coming week and asked if I would agree to meet up for a chat to find out more about the clinic above the Universal Pharmacy where this doctor had a practice. She would have read, Our Han SuYin Connection, my story first published in the now defunct Johor Buzz, the Southern section of The New Straits Times, back in 2008. In this piece, I pointed out that a renowned personality in the international literary scene who was also a medical doctor, once had a practice in a clinic above Universal Pharmacy, at Jalan Ibrahim in Johor Baru. This was the first and only pharmacy here and stocked a wide range of imported product brands. I also shared that my link to the pharmacy or dispensary, was that my Aunty used to work with the pharmacy downstairs and when I was ill, I was taken to consult the lady doctor upstairs, who replaced Dr Elizabeth C.K. Comber or Dr Chow, who had by then, left JB. Jalan Ibrahim and Jalan Tan Hiok Nee in Johor Baru. Many former patients still remember Dr Chow, a Eurasian lady doctor, who could speak Hakka, Mandarin, Cantonese, Malay, French and English. She was born Elizabeth Chow Kuanghu (Zhou Guang-Hu) in Henan Province, China in 1917 to Zhou Yuan Dong and Marguerite Denis, her Flemish-Belgian mother. She obtained her first degree at Yanjing University Peking and an honours degree of Science in French from Brussels University. After graduating from London University as a medical doctor, she started working in the Hong Kong Government General Hospital. In Hong Kong, she was known as Elizabeth Tang, the widow of General Tang Pao Huang, a one-time Chinese military attache in London. Later she married Leon F. Comber, a Malayan Special Branch police officer during the 1948-1960 Emergency and they relocated to Malaya. Dr Chow was also a novelist who wrote in French, Mandarin and mostly in English under her pen-name, Han SuYin. In 1955, Twentieth Century Fox made her semi-autobiographical novel, A Many-Splendored Thing, into a movie, Love is a Many Splendored Thing which won Oscars for best picture, best song, best score and best costume. Her husband, Leon F. Comber, in the background. I found it interesting that Zhang had done extensive research on Han SuYin for her thesis and when we met, we walked around JB’s heritage quarter, in the area where Universal Pharmacy once stood at Jalan Ibrahim. Then she shared with me, further details of her project on this fascinating personality whom locals knew as Dr Comber/Chow. While Zhang found some studies into Han SuYin’s literary works, her Eurasian identity and her controversial views about mainland China, she discovered that there was hardly any notable mention or meaningful research in her 12-year stay in Malaya. This gave Zhang the opportunity to explore a relatively unknown territory and fill-in the “missing period” of her life. In the span of three years, Zhang carried out research into a wide range of primary and secondary materials. This included the novels, memoirs and essays of Han SuYin, newspaper archives, rare photographs and newly uncovered documents like her lecture notes at the then Nanyang University, and numerous interviews with her family, friends, former colleagues and students, conducted in Singapore, Malaysia and Switzerland. Dr Chow lived in Johor Baru in 1956. Zhang felt that the Malayan period of Han SuYin’s life was very significant as it was an indispensable period of her life that shaped the person, writer and physician that she matured into. The circumstances in the post-war period of Malaya played a critical role in providing her with the platform and opportunities to actively participate in public discourse. Following the publication of her bestselling, A Many-Splendored Thing, while in Malaya, she continued writing on regional themes including three full-length novels, two novellas and numerous essays. Zhang said her favourite Han SuYin books were … And The Rain My Drink and The Crippled Tree because they captured the valuable core of post-war Malaya history and modern China, respectively. Because hardly any records were kept, Zhang found it almost impossible to trace people who were acquainted with Dr Chow during her time in Malaya. 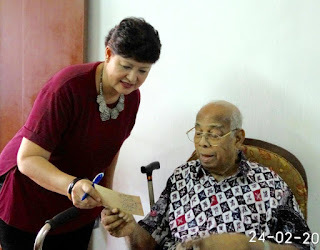 But she was thankful to have connected with Dr Chow’s adopted daughter, Chow Hui Im in Singapore and the lady who worked as Dr Chow’s domestic helper here. Johor [Left] with Princess Mariam and Lady Marcella. During her stay in Malaya, Dr Chow opened two clinics – one in JB with the other in Singapore’s Chinatown – and served as a college health physician and lecturer with Nanyang University. After leaving Malaya, Dr Chow and her third husband, Vincent Ratnaswamy, an Indian military engineer, lived in Hong Kong for a few years before they settled down in Lausanne, Switzerland. In 2012, Zhang and her husband visited Dr Chow in her home in Lausanne and they celebrated her birthday there. She passed away later that year at age 96. I appreciate how she shared new insights and rare photographs from her research and was pleased to be presented with her book, Han SuYin in Malaya, Doctor, Writer, Activist (1952 – 1964). This is a meticulous study that unearths, reconstructs and packs together – to an unprecedented degree – the 12 years that Han SuYin lived and worked in Malaya. Meanwhile, I’m enjoying the photos while waiting for the English version, which Zhang is currently working on. Note: Old photos are used, courtesy of Chow Hui Im. P. S. My essay, Our HanSuyin Connection, is also in my book, My Johor Stories: True Tales, Real People, Rich Heritage, published by MPH Publishing. A version of this was published in the February 2018 issue of The Iskandarian.